I do not know if this amount is reflective of how much a relatively beginning level knitwear designer makes, but I have a feeling this amount is not at the very bottom. I think of test-knitting as beta testing of a new pattern. By the time I start a test-knit, I have my pattern checked several times by me and my tech-editor, and I’ve already made a sample. So, for me, test-knitting is the last step before publishing a pattern. I know a lot of designers get their patterns tested first, tech-edited last. I used to do it that way too, but I noticed how stressful and frustrating it was for my testers then. Now, I get my patterns tech-edited first because I want to be sure the testers are working with the final version and have as smooth experience as possible. English is not my first language (not even second, or third), so I do not want to frustrate my testers with directions that are not clear enough or there may be some errors with numbers that I have not noticed. Yes and no. In theory, if I’m using the sizing standards and grading the sizes correctly, and I have checked the instructions thoroughly and the pattern has been tech-edited, then there is no need for test-knitting. In fact, Amy Herzog (I attended her Ultimate Sweater workshop at VKL NYC) advises against test-knits (because of fair compensation issues) and recommends finding/hiring a highly detail-oriented tech-editor. In reality though, after working on my patterns for so long, I reach a point where I stop seeing things, and my tech-editors often seem to miss a few things (they are human too), that my patterns still benefit a lot from being tested. 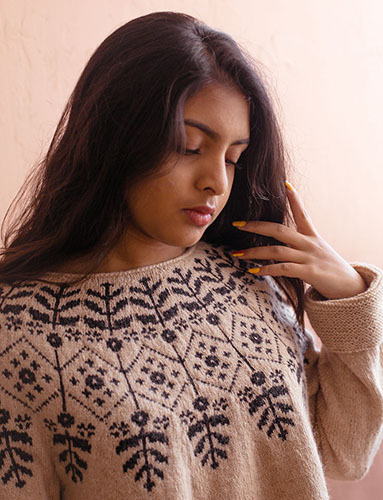 I send an announcement to my mail list sharing as much information as possible about an upcoming test-knit: a photo of the finished design, yarn, yardage, sizes, deadlines, and my expectations. Interested knitters respond, and we go from there. Most of the test-knitting discussions happen in my Ravelry group, where I create a separate thread for each test-knit. Some test-knits have to be kept secret due to the design being published elsewhere (not by me), so I share very generic information at first. When I get my test-knitting team assembled, I share all the rest of the information through Google Docs by invitation only. Generally, testers do not get compensated. Should they be compensated? It depends. As a knitter, the way I think about a test-knit is if I see a design that I’d like to knit, the timeline sounds reasonable, and the yarn is within my reach (either in my stash or within my budget), sure, why not. I’d be getting the pattern for free. Plus, I love giving feedback and helping someone out. And oftentimes, test-knits have the community aspect in them that they often feel like knit-alongs. On the other hand, knitting takes a long time and providing feedback (for me, this is the most important part of test-knitting) means spending even more time and effort. Because I depend on this feedback as a designer, I want to show my gratitude in some tangible ways. Usually, my testers get the final copy of the pattern they are testing, plus two more patterns of their choice from my Ravelry store. There are also occasions when yarn companies I’m collaborating with offer discounts for my test-knitters, and this is helpful in making yarn a little more accessible and a test-knit more attractive. Sometimes when I have tighter deadlines and stricter requirements, I try to make up for this by offering yarn support, either full or partial. To qualify for yarn support, a knitter should have previously test-knitted at least two of my patterns. How many testers do you usually get? I try to get at least one person per size. Do you have to find a tester for each size? Ideally, yes, but I have a harder time finding testers for the bigger sizes (sizes after XL), which I recently started adding to my patterns. I still include the sizes that have not been tested (if I don’t manage to find testers) in the pattern because all the sizes are graded following the same grading and mathematical reasoning. As a knitter, I feel more confident about starting a new sweater when I see its finished version in my size. So, this thinking makes me want to make sure all sizes get tested. However, sweaters take a long time and a lot of yarn to make, and the bigger the size, the more it takes to finish one. Moreover, Amy Herzog mentioned that one cannot fully rely on test-knitters’ feedback about the fit because we cannot see for ourselves if those knitters’ gauge is consistent throughout the project and what the exact finished measurements are. Because of these reasons, some designers (those who can afford) and most yarn companies hire sample knitters. Sample knitters are different from test-knitters in that they get compensated for knitting a sample. The biggest difference between sample knitters and test-knitters is that the former is a contractor and has a strict set of rules to follow. Sample knitters receive yarn, and they get paid at an agreed upon rate. This rate varies at approximately 10 - 30 cents per yard (or meter) depending on the company and complexity of the required knitting. Sample knitters send the finished objects (FO) to the companies that hired them. These FOs are checked to make sure all the pattern directions have been followed and all the measurements are consistent with the pattern schematics before payments can be made. What makes a good test-knitter? Every knitter who signs up for and finishes a test-knit is a good test-knitter in my books. That being said, there are certain aspects of test-knitting that I appreciate and look forward to in every test-knit. I do not expect every tester to meet these requirements, and oftentimes, with the variety of testers I get, pretty much all these aspects get covered in every test-knit I have conducted. Gauge swatching. For me, one of the biggest reasons for running a test-knit is to check the fit of a garment or an accessory. Unfortunately, if a knitter does not take the time to check the gauge (and to check if his/her alternative yarn is suitable at this gauge), the result will not turn out the way it is intended, and the fit will not be accurate. Being attentive to details. Sometimes, there are knitters who read a pattern, think they understood all the directions, and then rarely consult the pattern until they are done. What ends up happening is these knitters start filling information even if it is not there or interpreting directions differently based on their first reading. Unfortunately, these testers are not able to provide any feedback. I have heard from my detail-oriented test-knitters that they approach a pattern that is being tested as if they are beginner level knitters themselves. They say this perspective helps them spot problematic areas easier. Timeliness. Deadlines are there for a reason, and I try to communicate this as clearly as possible. And, I try to set the test-knitting timeframes as realistic as possible, estimating for about 1-2 hours of knitting a day. I really appreciate the test-knitters who finish on time. I also appreciate when knitters reach out to let me know if they are struggling with meeting deadlines (unforeseeable things happen to all of us). What I do not like is when testers disappear after receiving a copy of the pattern. I get disappointed by these people and try to avoid those knitters in the future test-knits. Communication. This is # 1 reason why I run test-knits. I love those testers who reach out with questions, comments, and suggestions as needed. I also love the testers who are able to communicate through their photography. And, I do not mean professional photography per se (though it’s wonderful if one can do that), but taking pictures so they can communicate how an item fits from different angles in a well-lit area (natural light is best).